Sometimes the coolest manicures require little to no skill – and this manicure is one of them. No precision, but all the impact. Acid-washed jeans are kind of like those manicures. They don’t take precision to create, but they definitely make a statement. Acid-wash jeans exploded into the style scene in the late 80’s/early 90’s and have had a place in style history ever since. For today’s Manicure Monday, I’m bringing back the acid wash … on my nails! After completing your basic manicure – buffed, filed, and coated with Nail Tek II – apply two coats of a dark navy blue. 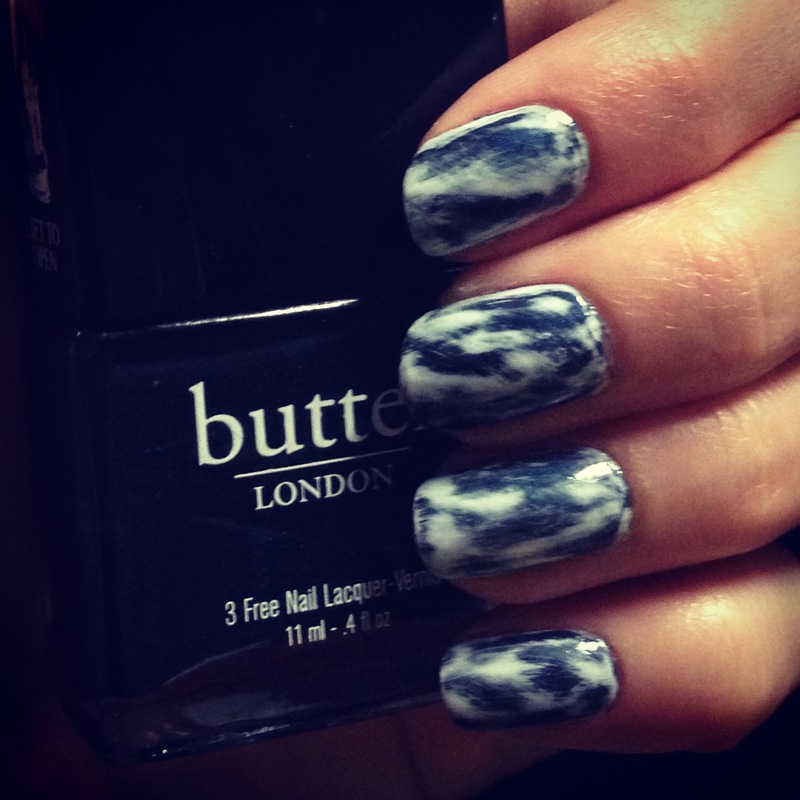 I used Butter London’s Big Smoke, a beautiful metallic navy blue. Wait until your base color is completely dry before moving on. The drier it is, the easier the rest of your manicure will be! For the second color, I used Sally Hansen’s Complete Salon Manicure in Lavender Cloud, a purple so light that it’s almost white. You’ll want to use a similar color – very light blue, light purple, or even white works. Apply one coat of this second color completely over the top of your base color. It’s okay if it’s not totally even – just make sure to cover your entire nail. Again, let this coat dry completely before moving on. Now the fun begins! To create your design, simply dip a Q-tip into nail polish remover and rub it over your entire nail. You’ll see that the top color will begin to disappear more in some places than in others, and you might just be smudging the color around in other places – but that’s what you’re going for! Acid wash is a totally uneven technique, so just continue this technique on each nail until you’ve achieved your desired look! Finish with a top coat – I used Essie’s Good to Go – and you’re … good to go! What do you think of this 90’s-inspired manicure? This is a fabulous look.